Belle and Sebastian are back with another three song EP. This time around the songs are: "I'm Waking Up To You", "I Love My Car", and "Marx and Engels". 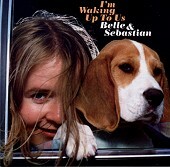 As is usual with Belle and Sebastian, all three songs are glowing pop songs, bouncy and jangly, and easily digestible. The lyrics are well written, the melodies fresh and blossoming, and the songs completely packaged, near flawless, from the perfect collection of instrumentation to the lush blend of boy and girl vocals.